Sorry, this entry is only available in English, Español, 日本語, Čeština and Deutsch. For the sake of viewer convenience, the content is shown below in this site default language. You may click one of the links to switch the site language to another available language. Ruben Lopez Mendoza from Mapbox has written a blog entry about how to install and use the JOSM tofix-plugin. Mapbox has published a starter guide on mapping with OpenStreetMap (under CC0). This guide was originally developed to aid the Mapbox data team. Martijn van Exel writes about the release of his missing roads project, which tries to find unmapped roads using computer vision. Saikabhi shares his excitement about his first edits in OpenStreetMap and making the most detailed map of his hometown – Jorhat, a small town in the Indian state Assam. Previously we reported about the meeting that took place between Rijkswaterstaat and the OSM-community in The Netherlands. Frank Steggink gives (translation) more details about it on the Dutch mailing list. Nine initiatives were started, and each initiative will have a contact person from Rijkswaterstaat and one from the community. Some of the initiatives are “OSM.nl for Dummies”, “Defining a real added value for both partners”, “Making the government geo-data (BGT) available for OSM”, “Destination signs”, “Aerial images”, etc. Pierre Béland is looking for a tool to help experienced mappers analyze data after a mapping party. A lot of data was added as response to the earthquake in Nepal. There were many new mappers who had never done any other mapping besides the mapping party in which they participated. The verification of this data is a huge job. Pierre’s approach is to find objects without a primary key (such as building, highway, etc.) or where the value is clearly a note (such as “highway=I’m not sure whether there is a road here”). He tried some analysis with his own tools on a planet dump of Nepal. With some help from the community, he got introduced to the JOSM plugin OSMantic and OSMRecPlugin, the second one seems to be promising for his needs. Also there are some disabled tests from Osmose that might help. (source: French mailing list – translation). Rory McCann is asking for volunteers who would like to translate townlands.ie into languages other than English. He’s learning German himself and will have a go at the German translation. On the 5th of December there will be a general meeting of the OpenStreetMap Foundation, with four 4 board member seats up for election. To vote, you must be a member for 30 days. Become a member now and vote or even run for a seat! Candidates who have put themselves forward so far can be found in the wiki here. Michael Reichert asks on talk mailing list about how to become an OSM member without a PayPal account. The GIScience Group of the University of Heidelberg, operates a Pybossa-instance for humanitarian purposes where crowd sourcing is used to generate ground truth data for automatic classification of algorithms (e.g. automatic road extraction from satellite images). Based on crowd sourced data the algorithm decides whether something is a road or not. Arun (PlaneMad) from the Mapbox Data Team writes about a Multilingual Map Test Tool by Jochen Topf. This tool renders a transparent overlay of name labels based on the language code given. After requests by different groups of people, English authorities have now released 11-Terabytes of LIDAR data under an “Open Government Licence”, which consists of a high resolution model of the country. See the wiki page that Harry Wood has put together here summarising the work that people have done with it. Matthias Meißer asks for legal help regarding the mixture of proprietary and ODBL data for special cases. Peter Vojtek published an experimental smartphone application for touchless map control which uses a smartphone’s accelerometer. He mentions that a possible use case is to move and zoom the map on your smartphone while wearing gloves 😉 The app is available on Google Play. In a detailed blogpost, Stephen Smith explains the use of Mapbox Studio with an example. Andrew Collier, in his series of articles, reports about the programming language Julia and its well documented interface for OpenStreetMap. BRouter 1.3.1 October 18th Compared to version 1.2 many enhancements and some bugfixes are included. On October 14th, 2015 was the 550th birthday of the creator of the Tabula Peutingeriana, Konrad Peutinger, which is known to be the latest dated map, showing the roads of the Roman Empire. There is even a route planner based on it!. 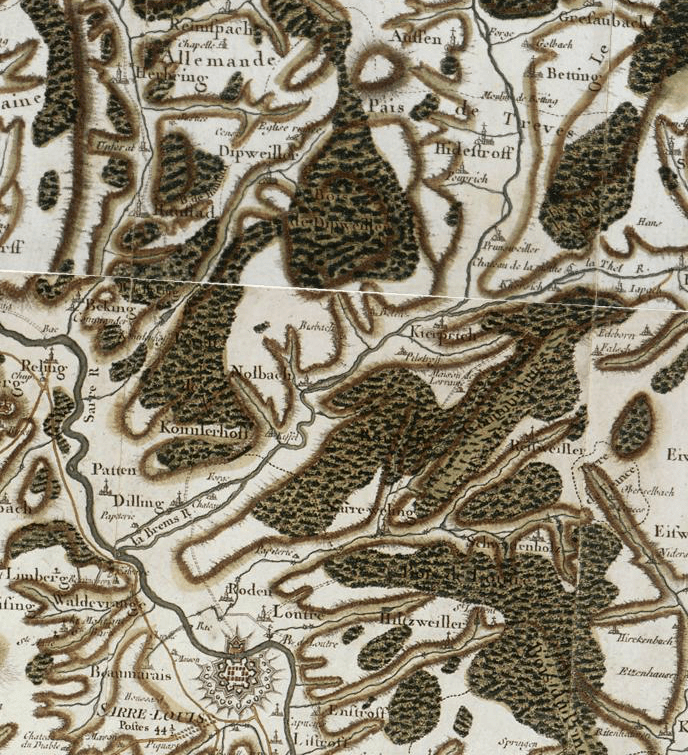 A French researcher digitized the Cassini map which has data from the 18th century. One of the main aims was to understand the development of infrastructure networks and the development of urban systems. Here is the online map. Geopackage is a new standard by the Open Geospatial Consortium, which is based on SQLite. It is recognised by some as a shapefile successor. Monde Geospatial have provided a link to a one-hour Webinar. However, whether Geopackage will permeate as a default format is yet to be seen. OGC standards are known for bloating and intensive XML use. Google has acquired the 360-degree-panorama specialist Digisfera to enhance its “Street View” team. Bing maps has implemented numerous changes to Bing Maps Preview. Using the new version of the elevation map of the Netherlands, an unknown maze was discovered in Arcen. (translation). The US Navy reintroduces sextant navigation in its education, because satellite based Navigation can fail due to technical issues or attacks. The US Merchant Marine Academy and the German Marine never stopped teaching this skill. The US is working on a regulation to force owners to register their drones to reduce private flights near airports. A quiz concerning western European capitals is realised on youtube.